I'M NO LONGER "LESS" AND I'M BECOMING "MORE"
Last month I wrote a post about not making myself small any more. 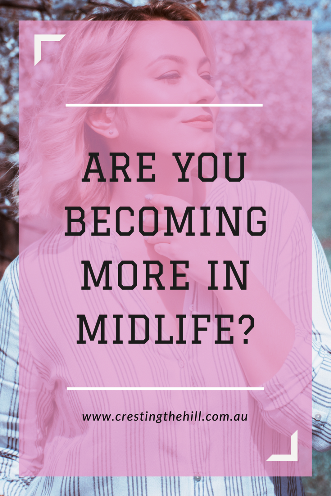 What I've found with the whole Midlife post 50 journey is that it's time to become more "Me" - finding who the real "Me" is and doing all I can to enable that woman to reach her potential. Not always sitting in the background watching life happen, but embracing opportunities as they come my way and doing my best to live my best life possible. Living my best life now doesn't mean that my life before this hasn't been wonderful, because it has - in so many ways. I had a pleasant childhood, fun teenage years, lovely times as a young wife and mother, the joys of seeing both my children settle into lives of their own and marry their own special people. But living my best life now means I'm finally spending time finding out who I am and really enjoying the process. I like "me" and I like that I have the space now to work out what I actually enjoy and to invest in things that grow me as a person. I'm not apologizing for spending that time on myself because I've earned the privilege and it's allowed to be about me now. I'm excited about what's next, about discovering new "passions" and interests. 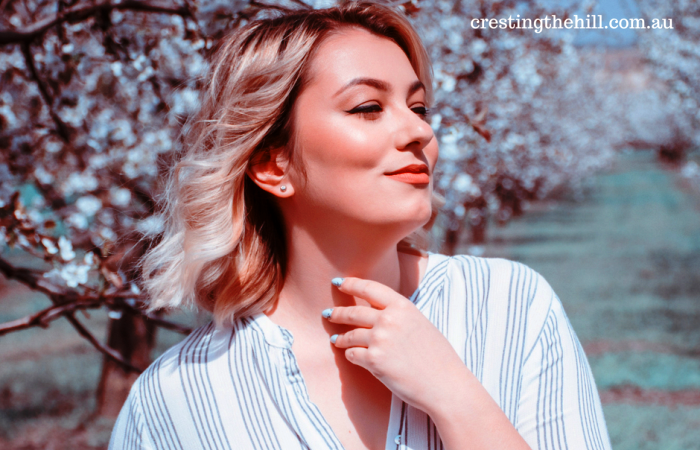 I love how blogging has opened the world up for me - women from so many different cultures who are all figuring this stage of life out with me. We're all looking to be our best selves and doing it in ways that are authentic to our own beliefs and life journeys. I really like being open to trying new activities - I may never parachute out of a plane, but I was brave enough to go to a Tai Chi class on my own and start learning a new skill. I've tackled some online learning, I've tried my hand at a knitting project, I'm doing some volunteering, and I'm open to whatever might come my way. If I fail at something or I don't enjoy it, well that's okay too - toss it in the bin and move on because there is always more waiting to be discovered. It's time to chase those things that feed my soul - there will still be all the daily chores and responsibilities, but now I have more time to pursue the things that make me smile. To give back, but also to enjoy receiving without feeling guilty about it. To invest in friendships that are reciprocated, not wasting time on people who are too busy to catch up. To enjoy special moments with my family without expecting anything in return, other than shared time and special moments. How wonderful it is to be settled and serene (for want of a better word) with where I am in life. It's so lovely to not be hankering after anything or anybody. I feel like I've done all the things that are really important to me, figured out which are worth investing more of my time into down the track, and which can be ticked off and left behind. I don't have a mile long bucket list, instead I have a "done it" list that I can review with a smile and then sit back and feel content. There's still more to come, I've travelled (done it) but want to travel more, I've raised and released my adult kids (done it) but still want to have a place in their lives, I've been married for 35 years (done it) but I'm only half way there - so much more still to come, but so much satisfaction with my life already. I've put in the hard yards and I know what I believe and I know who I'm accountable to. I don't need to impress anyone, I don't need to jump through hoops or fit into other people's boxes. Now I can have the confidence to live large and to be all that I'm capable of being. I love the freedom of taking ownership of my life and no longer dancing to anyone else's tune. Sweet relief and so good to have put all that behind me. I hope your Midlife is becoming "More" too - I hope you've realized how fantastic these years are and that being 50+ is a blessing, not a chore. I hope your Midlife is filled with peace and joy and too many blessings to count. I hope you pause now and then to smile and to relish all that Midlife offers - and that there is still more to come. I love this concept. When it comes to life experiences and making the most of the opportunities that we have, more is absolutely more - let's kick the less is more to the kerb. I couldn't agree more Jo - I am so tired of accepting less and making myself less. Surely after 50+ years of it we can allow ourselves a bit of time in the sun? Wow, I really love the idea of a 'done it' list rater than a bucket list. That's a great idea of looking at life! I'm not sure I've reached your level of contentment yet but I know I'm wiser and more comfortable with myself than when I was younger, and that is a very good thing. Thanks Mum - you're a great example of living life on your own terms - more is definitely more! Another Tai Chi fan! And yes, you're so right that we can take the time to be kind to ourselves and have that flow on to others - I'm loving Midlife! Yes! What an uplifting and empowering post! Thanks SSG - if now isn't my time then I don't know when else would be! I think this is why I LOVE getting older. I feel so much better in my own skin and don't have all of the angst I used to have!! I know what you mean Jodie - I think we generate a lot of that angst when we're younger and it's really nice to let it go and just enjoy life for what it is. I take into consideration that right now I am healthy and want to do things while I still can that I enjoy. Like you say if it isn't doing it for me the person, activity etc, it is set aside and I move on! It is liberating using time where you want. Hi Sue - I think we all need to have things to aspire to - it keeps us fresh, but it's also nice to sit back and look at what we've managed to achieve so far. I love that I'm pretty content these days and don't have any driving need to do anything spectacular - just little new things that pop up and seem interesting. Beautifully said Natalie and so true - when we can see how blessed we are then we don't really have much to complain about in this life. It just seems to me that Midlife has given me space to appreciate what I have and to look ahead to see if there's something new I'd like to try one day. Bring on all that happiness! Mid-life is an exciting phase, Leanne. Enjoy every minute of it. Thanks for hosting #MLSTL. Yes, I totally agree! For me, the last 4 years especially have taken me on a journey of becoming more of me just for me alone. I think at any point in your life, you can become more. But, it is a bit difficult when lots of other things compete with your attention to yourself: kids, a demanding job, health problems, etc. Here I am, at almost 65, and I just returned from hiking 84 miles on the Hadrians Wall path. I didn't think I could do it. It was a huge stretch for me to get out of my comfort zone, leave my house and travel all the way to northern England - and then, to hike 12 days in a row. But it was an awesome experience. And it left me feeling so empowered. I wrote about it on my blog, with great pics, in case you want to know more. I love this post, Leanne. We need these nudges to remind ourselves that it's never too late. Hi, Leanne - I agree that now is the time to make the most out of the opportunities that we have. It is also the time to seek out those opportunities, and to think out of the box about how to embrace them. Another great post! Thanks Donna - I keep coming back to that saying "if not now, then when?" because now is our time - we don't have to be having giant adventures, but we need to be living lives that are true and authentic and enriching - or we'll wake up one day and it'll be too late! Oh yeah! I feel I'm becoming more. I feel free to choose how I spend my time and with who. For awhile I stopped volunteering and now I've chosen to volunteer in a hospital gift shop, not out of guilt... more out of loving meeting people and giving. I just posted on FB "Boundaries are firm requests for respect" (Doe Zantamata) We're not mean for setting them. This is a wonderful post for sharing on FB and Twitter for #MLSTL Leanne! Hi Agnes - I think it's really important not to negate all that we've lived through and achieved (or survived) to get where we are today. But at the same time, we need to grab this time that we now have and make it ours - not sit around wallowing in memories or waiting for life to decide to come knocking at our door! Leanna you have really eloquently explained what is best about this part of our lives. 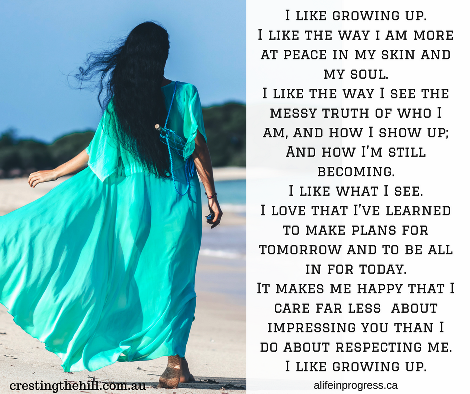 I love your comment, "I'm not apologizing for spending that time on myself because I've earned the privilege and it's allowed to be about me now." We have earned the right to spend time on ourselves. At first that felt indulgent, but not any more. We can decide that the useful parts of our lives are over or we can jump in with both feet and find new things we love and that we are passionate about and that give our lives purpose. I say YES to more! Hi Jennifer - I've dealt with the whole "selfish" thing too - it feels like we're being greedy wanting to own our time and to do things just for "me". But I'm moving past that too now - I'm happy to be there for others, but I now acknowledge that I'm worthy of a bit of attention and time and love too - and nobody is going to give it to me unless I ask or do it for myself! Free to me be! Yes! That's what I love about getting older. I'm not trying to fit into other people's pegs anymore. I'm not reading someone else's script for my life. I'm writing my own. I love it Leanne! I especially liked how you said you try new things--if you fail or you don't like it, you just move on. So many times I've worried that if things didn't turn out the way I thought they would, I had wasted my time or my money, but now I see that's not true. I always learned something or added to my experiences. None of it was wasted. That is such a freeing concept. Life is good and I expect it to get even better. Thanks for the #MLSTL community. I think your "done" list is pretty impressive Jo and I also think it's lovely that you're happy to rest on it a little and not feel that you have to keep pushing to prove something. Isn't it love to be able to rest on our laurels a little and take things at the pace that suits us? And that would include Borneo for you! Thanks Jan - I feel so sorry for women who reach Midlife with no purpose or direction and are just sitting spinning in one place with no idea how they want to tackle then next half of life. I'm so glad I had enough self motivation to find things that interested me enough to fill my world and not sit sad and bereft wondering what happened to my life! Very good points raised and thank you for sharing. I have never made a bucket list but I like your idea of a done it list. Thanks Enda - I love it when blokes don't go all desperate and crazy at this age, but just get on with enjoying all it has to offer. Beautiful post. Very inspirational. My struggle is I have all the "feels" of this post, but my aging body is not willing. I just believe wholeheartedly that we become what we choose to become Amy - I'll never be Sue or Jennifer who love exercise and are super fit, but I can enjoy being outside walking in the fresh air, having coffee with friends, enjoying my husband's company, and so many other lovely little joys at this stage of life - no marathons, but plenty of joy! Thanks Jeremy - I think somewhere around our mid's we start to wake up to the fact that we're not teenagers any more, we can embrace that and enjoy what the second half of life offers, or we can fight it and be miserable - I know which choice I'm making! I am pretty much what you see is what you get. Midlife is not turning out the way I planned it but I guess I can look at it as a new adventure. It certainly threw you a curve ball Victoria, but at the same time, you've decided to tackle it head on and with positivity (not curled up in a corner weeping) that's a sign of someone who knows who they are and where they're going! I love your idea of a 'Done It' list, instead of a bucket list. It puts the emphasis on our accomplishments, not on all we're longing to do that we haven't done. I wouldn't go back to those early days either Brenda - maybe for a day visit but I wouldn't want to live them again! I love the calmness and centredness of this stage of life, but I've also realized that it depends largely on me to make things work - if I wait for others I'll be sitting around twiddling my thumbs for years to come! Every since my spouse got diagnosed with a lung disease called COPD in 2013, which has no cure and gets ugly towards the end...he is in Stage 4 now in 2018, he is in mid 50's and I am just past the 50 mark. I have spent the past couple years exploring who I am and what I want in life when for the first time ever I will be on my own. I have learned that I have refused myself to live out dreams Way to long!! Hi Molly - I was the same - nothing really to complain about with my first 50 years, but so many of them were about other people and their needs. Now I have more time to figure out who I am and what I want - that's not selfish, it's empowering - and it's not before time!